More than half of Fortune 500 companies now use Google for Work, according to the search giant. We also depend on Google’s suite of cloud products for our daily productivity tasks here at ITWC, including Gmail. If you are like us then these hacks will make your life more productive, help you get more leads, sales and revenue. It may seem farfetched now but just wait until you reach the end to judge. Even if you don’t use Gmail, you can take a look to see what you’re missing out on. Update: At the end of this post, learn how to get unlimited cloud storage for FREE. GreatCanadian+Toronto@gmail.com for your clients from Toronto. Greatcanadian+Sales@gmail.com for sales related emails. Greatcanadian+Newsletters@gmail.com to manage your subscriptions. Ever wonder where all that spam in your inbox comes from? Now you can find out by using a different customization when you sign up for a service or newsletter. You can then get rid of those emails by putting in filters to those emails. It also comes handy in the sense that many companies offer a 30 days free trial per email signup. You can practically use unlimited variations of a single email to… you get the idea. 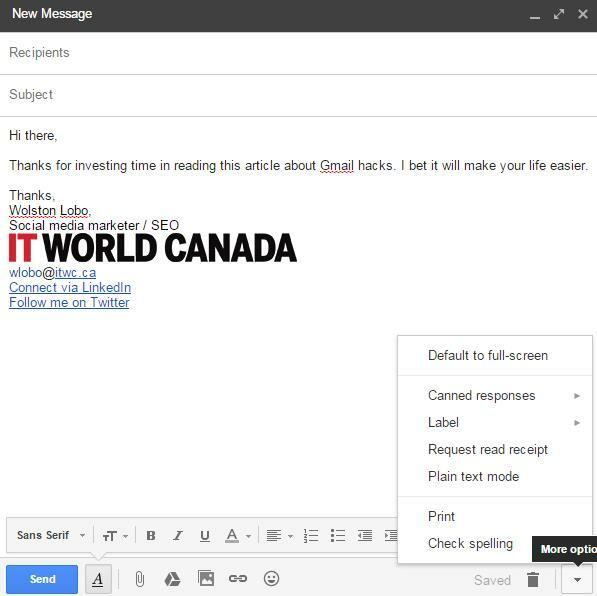 In addition, you can use Gmail’s filter feature to organize more efficiently using this method. Ever wanted to impress your clients by making it look like you work late in the night or early in the morning? This app allows you to write an email now and schedule it to be sent at a later time. I use it mainly to send email reminders to people in the company to contribute to our social media campaigns day after day. I create the email once and schedule them to be sent every alternate day which saves me time and serves the purpose. There are times when I read an email and forget about it because I have more important work to do at that moment, only to realize that no action was taken on the read email. This feature will let you make the email reappear as a new email in your inbox at a time of your choice. It serves as a reminder about an upcoming trip; work anything else that is important to you. This feature can come handy when you want to do something mundane like reminding your employees or contractors to complete their time sheets or pay your company bills. Similarly, you can also resend the mail or reminder to yourself if a reply is not received. After you’ve composed the email, click on more options. 1. Introductory emails about your business or yourself. 3. Thank you emails and scheduling meeting emails. 4. Saying “No” when you need to. If you have a hard time answering in negative, maybe just clicking a button to do so will be easier. 5. If you get a whole lot of emails that do not require a personal touch then you could use Gmail filters along with canned responses to promote your product/service or get people on your subscription lists. The fifth point alone is worth a lot of leads, sales and money if implemented in the right manner depending on your product / service. 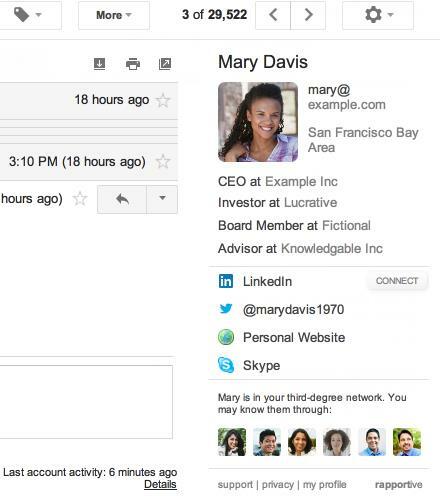 This Chrome extension for Gmail will help you get more information on the person you are emailing. Simply hover over their email address and you will receive a wealth of information about them if they are active on social networks. Take a look. This comes in handy when you see how you’re connected to them on LinkedIn. This could be really helpful for sales people to get instant reminders about how you met a contact, and see what level of organization they are with, so you know what level of service to pitch them on. Before using this feature I used to hit send and then suddenly remember that I forgot to mention something important or that there was a better way to communicate. It gives you a 30 second window to cancel sending after pressing the send button. To activate it, sign into Google and go here. It is especially handy when you are communicating with clients. We have covered several stories about how some spammers and scammers pretend to be a commonly used company or service like Paypal, eBay, Facebook etc. Many people at work or otherwise fall prey to them. This Gmail trick will help protect you against such malicious attempts of phishing and hacking. Go to Gmail Labs which is under settings or simply click here. Enable Authentication icon for verified senders. There are many other cool things that you can enable in Gmail Labs if you dig deeper. If you have a cause to suspect that your account details have been compromised, you can verify the authenticity by checking your account activity. 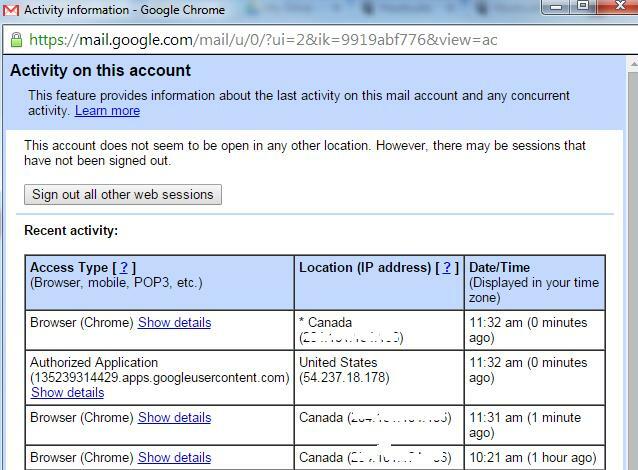 Simply go to the bottom of your Gmail account and to the right hand corner you will see “Details.” Click on that and check the IP addresses which have logged in recently. You will also see the country from where the activity has taken place. If you see a different country than the country of your residence or visit, then remember that you may have authorized an app which may have logged in. The image below is a screenshot of the activity on my account. Though I’ve never fulfilled the dream of visiting the US of A, one of the locations says United States. I panicked the first time I saw it only to realize it was an app which I had authorized before. Clicking on show details will let you know if it was an app, or a person with a web browser accessing your account. 1. Labeling emails 2. Skipping the inbox 3. Marking unimportant mails as read 4. Sending a canned response 5. Categorizing the emails etc. The good part is that you can apply these filters to not only the future mails but also mails from the past which can really help clear large cluttered inboxes. In the same vein of clearing and organizing your Gmail inbox, this nifty service will help you reach zero unread emails quicker than any other app or feature. Once you login with your Gmail account, it will populate a list of emails that you have subscribed to. Now all you have to do is either unsubscribe to unwanted emails or just roll important ones into a neat daily digest. If you’re drowning in emails, this is your lifeguard. Running out of Gmail space? Some of your employees, especially those who deal with heavy graphic files may face this problem. Google provides 15 GB of space for Gmail, Google Drive, docs etc. However, if you or someone you know is fast approaching this limit, you may want to find the mails which are consuming a lot of space. But that is time consuming especially if your inbox runs into thousands of emails. Go to the search box and paste size:5m or larger:5m. This will show you mails which are 5 MB or larger in size. You can check this for any number size. If you`re the type who has to attend several meetings a day then this widget will make your life more organized. Just head to Gmail Labs and activate this. It will get your calendar below the labels on your inbox. You may or may not have used If This Then That. This service will let you automate a lot of tasks. For example, this recipe right here will automatically add receipts and orders to a Google drive spreadsheet called receipts. There are thousands of more like it which will make Gmail work for you like clockwork. Has the thought of being unproductive when offline ever scared you? Well this feature will help lay those fears to rest. Gmail offline lets you reply and do everything that you need to with your email when you are off internet. It will sync all that information when you get back online. There are several shortcuts which can quicken your pace of doing things on Gmail. Right from composing a mail to opening group contacts, this feature can do it all. Here is the complete list of them. Similarly, Gmail Labs has something called quick links which lists the various places which you visit often and its placed below labels. This tool from Hubspot notifies you when someone you sent an email to actually reads the mail. This is really helpful since you get an idea whether the seller, buyer, vendor, employee or anyone else has attended to your email or not. In addition, you will also know when people are most likely to read your emails. You can then use this information to tailor the next email. Remember to share with your friends and let me know which one of these you are going to implement today. Next Page: How to get unlimited cloud storage space for FREE!